Roundabouts can facilitate the interchange of relatively high volumes of traffic with shorter delays than might be experienced at other types of junctions. They are priority junctions, in effect a series of “T-junctions” arranged in a ring, and operate on the basis of gap acceptance. Roundabouts work as long as the circulating area and the exits do not back up. Roundabouts can work well for cyclists and pedestrians but only if designed to specifically address their needs and expectations. Safety, and not capacity, is the over-riding principle for good roundabout design. 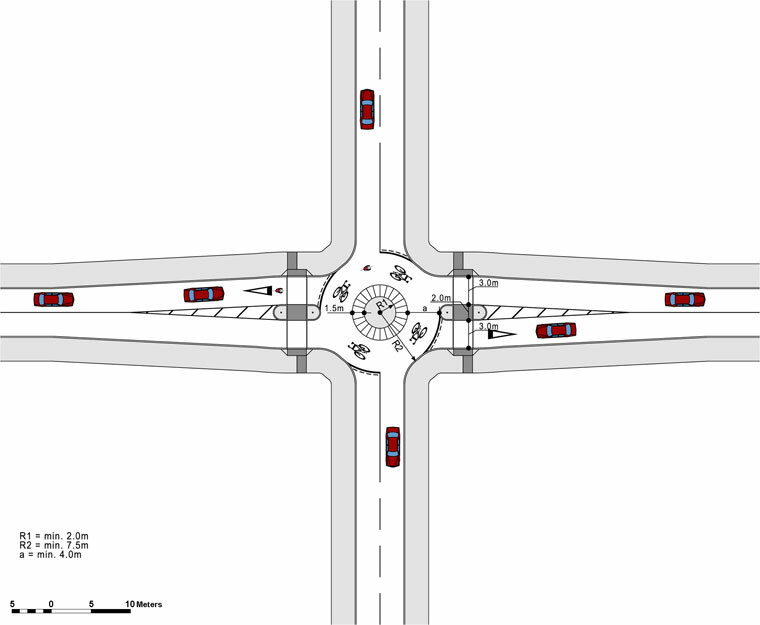 The design principles are very similar to those for Side Roads of T-junctions. Approaching traffic should be slowed (to stopping speed). This provides better gap acceptance, greater legibility for drivers and a safer cycling environment. 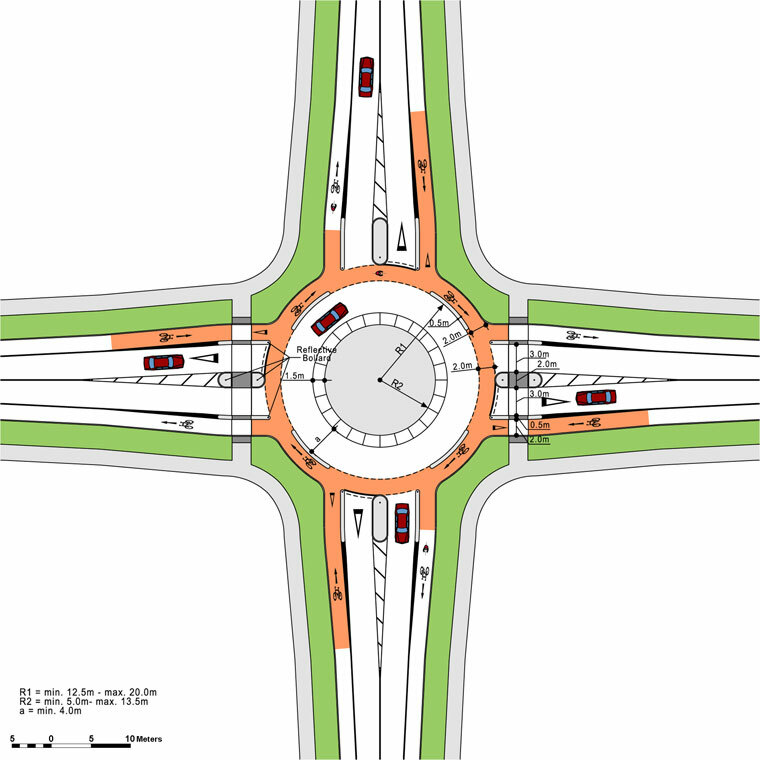 Traffic speed on the roundabout should also be controlled by means of a narrow gyratory lane. Approach arms should be aligned towards the centre point of the island and not deflected to the left. Traffic lanes should approach roundabouts at right angles rather than obliquely, and without any flares. This makes it easier to see cyclists and traffic on the roundabout. It is easier for pedestrians to cross the mouth of the side road. Multi-lane approaches are not recommended, as vehicles in the outer approach lane preclude eye contact between traffic on the inner approach lane and cyclists on the roundabout. Double or multiple gyratory lanes are not cycle friendly due to traffic weaving and the risk of side swipe. Depending on the traffic balance between arms, single lane roundabouts can accommodate up to 20,000 – 25,000 vehicles per day. It is important to remember that the capacity of a roundabout is the total number of vehicles using, and not the number approaching it from any one arm. Cyclists can mix with traffic at roundabouts with traffic volumes of less than 6,000 vehicles per day. These are cost effective and space efficient. Segregation is necessary above 6,000 vehicles per day, and specific design features must be introduced to ensure the safety of cyclists. Roundabouts in urban areas typically should have an external radius “R1” of between 5.0m and 16.0m. In order to minimise vehicular speeds, the width of the circulating lane “A” should not exceed 3.5m to 4.0m. Additional over-run areas can be provided at the central island, if required to cater for occasional oversized vehicles. The internal radius “R2” can be as small as 0.5m to 2.0m in the case of mini-roundabouts, but otherwise ranges from 2.0m up to as much as 12.0m. In principle, approaches should be perpendicular, and the central island should be wide enough to deflect the path of “straight through” traffic and ensure that approach traffic speed is slow enough to stop if necessary. It is important that the roundabout is legible and well signed in advance. There are four types of roundabouts that can be used in urban areas for cyclists depending on the traffic speed and the design capacity of the junction. These are detailed below. Multi-lane roundabouts are not safe for cyclists. With one or more circulating lanes and/or multiple approach and exit lanes, the risk of collision is too great. Where these are required for vehicular traffic, fully segregated grade separated or alternative cycle alignment solutions should be considered to ensure a safe cycling environment. Mini-Roundabouts are characterised by a painted central island, 0.5m to 2.0m in radius, domed to a maximum height of 75mm (25mm on bus routes) and with very visible painted arrows indicating the gyratory direction. 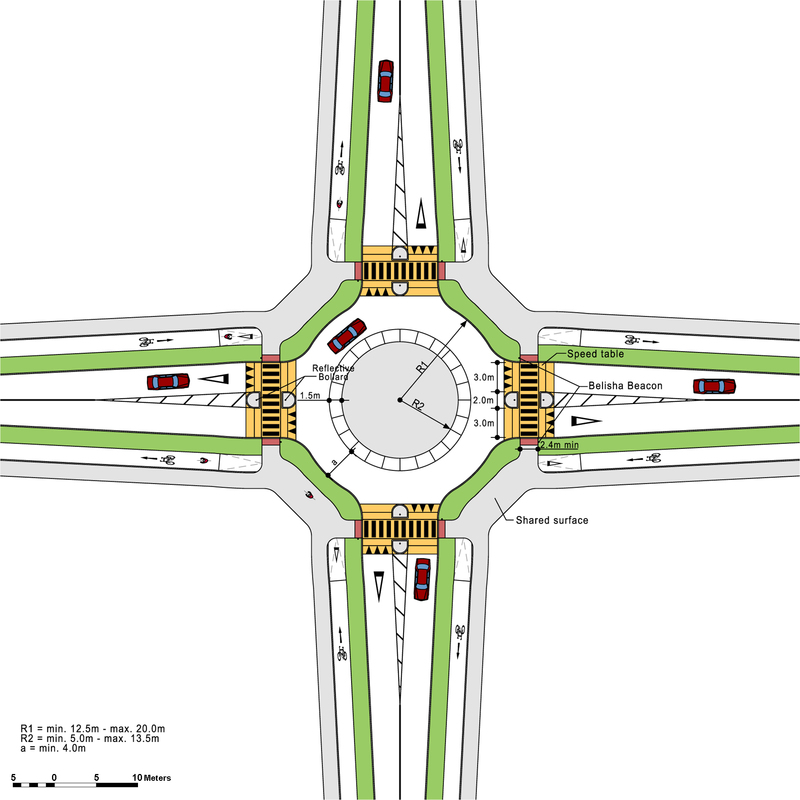 Mini-roundabouts have narrow single traffic lane approaches and a shared circulating area with a ‘tight’ geometry to ensure minimal traffic speed. Mini-Roundabouts can be used in mixed street environments at junctions with design capacities of up to 2,000 vehicles per day, and where the vehicular speed on the approach roads is less than 30km/h. Larger vehicles can negotiate the tight geometry by over-running the central island. These are characterised by a dedicated circulating cycle track that is highly visible and segregated from the main vehicular circulating lane by kerbs. They will also have a built central island clearly defined by a solid kerb and with a radius between 4.0m and 12.0m. Shared roundabouts have single traffic and cycle lane approaches and a single traffic circulating lane with a separate segregated cycle track. 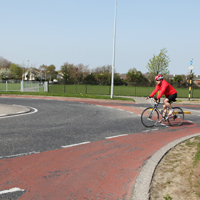 For use on roundabouts with deign capacities of 6,000 – 10,000 vehicles per day, this solution provides dedicated space for cyclists both on the roundabout and at the entry and exit points that prevent the cyclist from being “squeezed”. 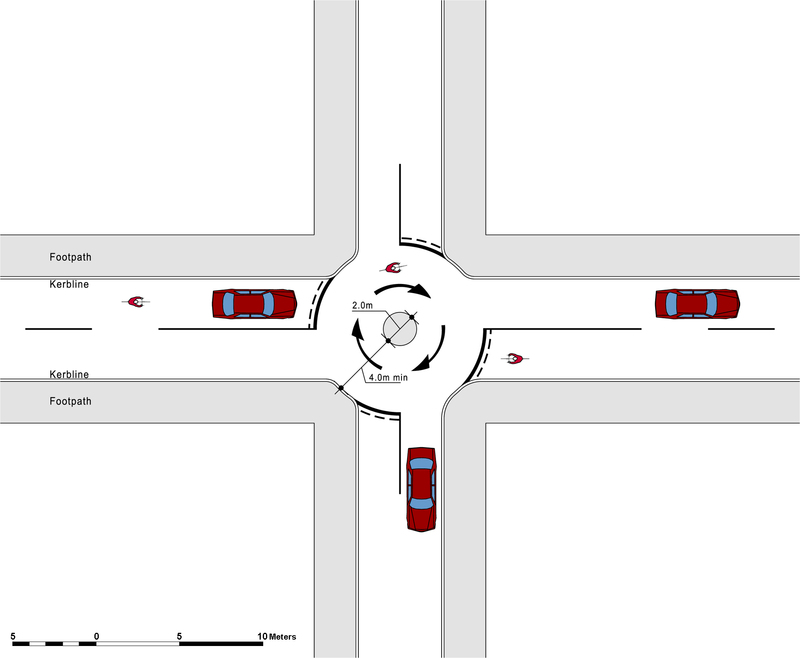 Roundabout arms should have narrow entries and exits, aligned to the centre of the roundabout, and minimum flare (sufficient for standard vehicle tracking). Hedgehog kerbs on the roundabout should have a width of 0.50 to 1.00m, and must be highly visible and obvious to motorists. Fully segregated roundabouts are required for higher traffic volumes. Junction approaches have segregated cycle tracks and the roundabout itself has a single traffic circulating lane and a segregated circulating cycle track. They have a built central island clearly defined by a solid kerb and with a radius between 4.0m and 12.0m. 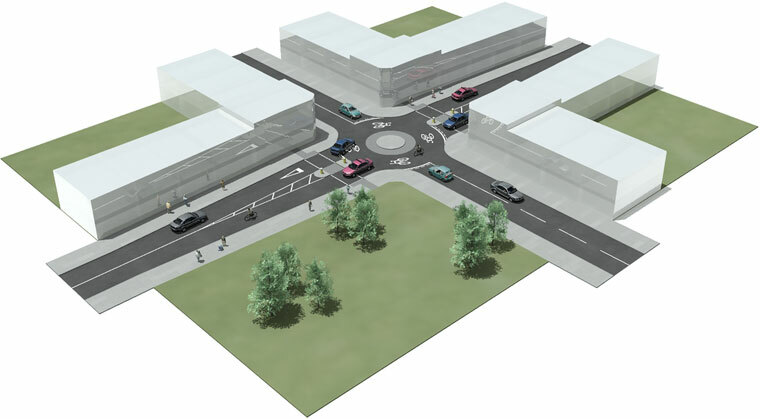 Fully segregated roundabouts are required where design capacities are greater than 10,000 vehicles per day. Cyclists are required to stop. Vehicular approaches to cycle crossing must be at right angles for optimum eye contact. Multi-lane roundabouts, with one or more circulating lanes and/or multiple approach and exit lanes, are not suitable for cyclists. Fully segregated grade separated or alternative cycle alignment solutions should be considered to ensure safe cycling continuity. 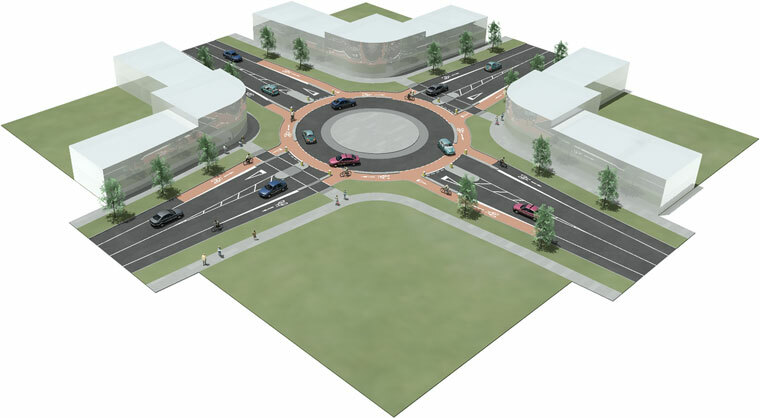 Many existing urban roundabouts were designed primarily from a motorist or capacity perspective, and are not conducive to safe pedestrian and cycling movements. Flared multi-lane approaches can be converted to single lane right-angled approach lanes as shown below. The benefits include a safer cyclist and pedestrian environment, slower speeds and reduced risk, greater legibility for drivers and better gap acceptance. Traffic queuing may increase slightly in the peak periods. This should be considered in the context of the traffic plan for the area. 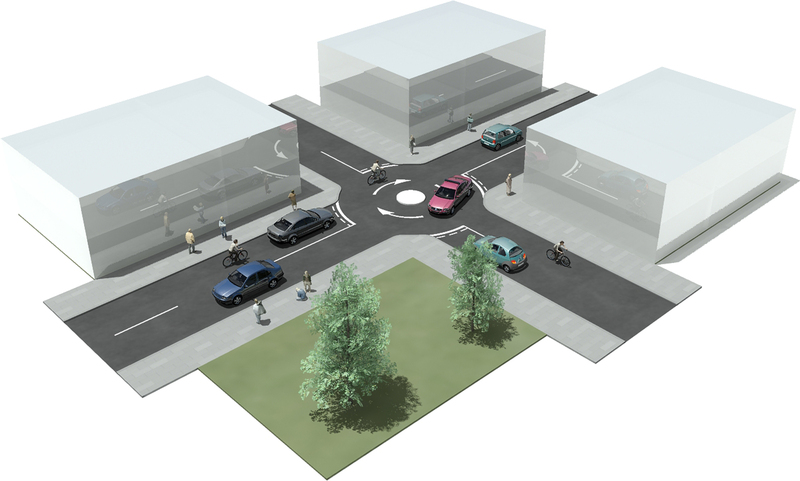 Overrun Areas can be provided on any of the roundabout types above in order to accommodate occasional larger vehicles. The overrun area is separate to the circulating lane and forms part of the internal central island. A 50mm kerb should be provided to between the circulating lane and the overrun area. The preferred width of the overrun area is 1.5m to 2m.